WHEN Donald Trump tweeted on August 5th that tariffs were working “big time”, American media sprang into action to test the claim. In China, editors were more circumspect. No major Chinese-language newspaper reported his tweets. One of his claims—that China’s stockmarket has fallen 27% in the past four months—was an exaggeration. But why would any self-respecting propagandist in Beijing dwell on that? Chinese stocks have indeed fallen sharply (see chart), which officials do not wish to emphasise. Making matters worse for China is a whiplash effect. Until recently officials and executives believed their own declarations of technological prowess. Privately, advisers were confident that Mr Trump could be placated with promises to ramp up imports from America. Now both views look wanting. An agreement for China to buy more American natural gas and soyabeans collapsed in June. Chinese officials are keenly aware of vulnerabilities; had America maintained its sanctions on sales of semiconductors to ZTE, the Chinese telecoms giant might well have gone out of business. Those with a conspiratorial mindset see things in a darker light. “The Americans don’t want a deal. They want to screw us,” says a fund manager. In the annals of western intelligence blunders, the failure to notice the Sino-Soviet split in the frigid depths of the cold war looms very large. Despite a small group of heretical CIA officers pointing to mounting evidence from the late 1950s onwards, successive governments in Washington and elsewhere refused to believe that the two biggest members of the communist bloc actually hated each other. It was not until China and Russia fought a war along the Siberian-Manchurian border in 1969 that the sceptics finally accepted the schism was real. Today the west risks making the opposite mistake by dismissing the anti-western, anti-US alliance that is now forming between Moscow and Beijing. At a conference in Singapore in June, Jim Mattis, US defence secretary, talked about a “natural non-convergence of interest” between Russia and China and his belief that both countries had more in common with America than with each other. This idea that Russia and China can never really be friends is just as wrong and dangerous as the cold war dogma that portrayed global communism as an unshakeable monolith. Even as many in the west dismiss or ignore the rapidly warming ties between the two countries, presidents Vladimir Putin and Xi Jinping have gone to extravagant lengths to praise each other, in a budding bromance. According to Mr Putin, Mr Xi is the only foreign leader he has celebrated his birthday with — over a glass of vodka and a plate of sausage. For his part, Mr Xi recently called the Russian president his “best, most intimate friend” while presenting him with China’s inaugural friendship medal. It is easy to dismiss this all as superficial posturing, but such gestures between autocrats matter immensely to their respective systems. The two leaders have met at least 26 times since Mr Xi made his first overseas trip as paramount leader to Moscow in 2013. It is true that Russia’s ego has been bruised by the obvious role reversal — from the former Soviet Union as “big brother” to Russia as “little brother” today. But China has been careful to save Moscow’s pride — by speaking of the two as equals, massaging Mr Putin’s ego and offering many of his confidantes and advisers lucrative contracts. While heavily lopsided — Russia’s economy is about one-tenth the size of China’s — the countries’ economic relationship is critical for both sides. China is the world’s biggest importer of crude oil; Russia was China’s biggest supplier last year and Beijing has lent tens of billions of dollars to Moscow to secure future oil and gas supplies. Crucially, from Beijing’s perspective, oil imports from Russia do not need to travel by ship through strategic chokepoints, such as the Strait of Malacca or the Gulf of Aden, that can easily be shut off by the US military. Again, this is not just friendly rhetoric. Until recently, Chinese naval vessels had not strayed from the country’s coastline for centuries, but today its warships conduct regular joint exercises with Russia from the Sea of Japan to the Mediterranean. For decades, Russia resisted selling its most advanced military equipment to China but it has now abandoned that policy. In May, Beijing deployed the latest model Russian fighter jets in a show of force over democratic, self-ruled Taiwan. The most important unifying factor between the two is ideological. Mr Xi and Mr Putin are strongmen autocrats who share an aversion to representative government and a deep fear that they will one day be thrown out of office by a US-backed “ colour revolution”. Their tightening embrace is as much about antipathy towards the US and the US-dominated global order as their rapidly growing common interests. This presents an opportunity for Washington to drive a wedge between them before their alliance becomes unbreakable. The failure to accept the reality of the Sino-Soviet split in the early 1960s allowed the so-called “domino theory” — the idea that global communism had to be confronted everywhere to stop its spread — to become orthodoxy in Washington. If the US had attempted rapprochement with China a decade earlier than it did under Richard Nixon, perhaps the horrors of the Vietnam war and China’s Cultural Revolution could have been avoided. Thanks to its continued rise and obvious ambition to supplant the US, China is a far bigger long-term challenge for America than Russia. No less a figure than Henry Kissinger — the architect of that reconciliation with China in 1972 — has reportedly counselled Donald Trump to pursue a “reverse Nixon-China strategy” by seeking to befriend Moscow and isolate Beijing. Given the current investigation into possible collusion with Russia, it will be almost impossible for the US president to pursue such a strategy successfully. But American institutions, and whoever succeeds Mr Trump as president, must recognise how serious a threat the nascent Sino-Russian alliance is to US interests — and the current world order. It has been 40 years since Deng Xiaoping launched China’s “reform and opening up” policy. By most metrics, China’s economic “miracle” has indeed been nothing short of preternatural, with some 800 million people rising out of poverty over the span of just a few generations and the country becoming an indispensable part of the global economy. But this growth happened neither evenly nor sustainably, and it’s running out of the sort of low-hanging fruits that fueled China’s rise. As a result, like most developing countries, China has a fundamental problem: It wants to transition to a consumption-based economy (which is more stable than relying on exports and investment), but its domestic consumer base is not yet wealthy enough to support the level of economic productivity needed to allow for that transition. 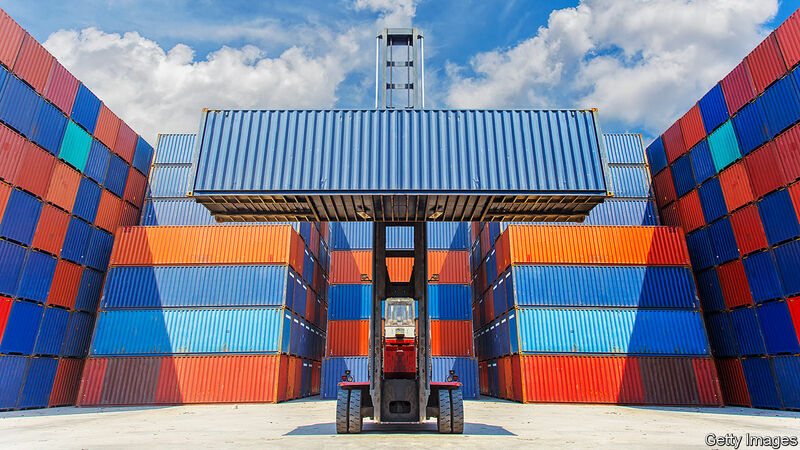 With a trade war looming, a shift to domestic consumption is becoming all the more urgent. Beijing is scrambling to conjure up yet another economic miracle. This Deep Dive will explain why the economic model that made much of China rich is nearing its expiry date, with continued, even if slowly declining, dependence on cheap exports and investment now creating as many problems as it solves. We’ll check in on China’s efforts to make the leap many of its neighbors did long ago, to a more stable model based on consumption, services and high-tech industry. Ultimately, we conclude that China’s progress has been mixed, at best, with new risks emerging on the road ahead. More than anything else, China’s growth has been fueled by three things: cheap exports, investment and the one-time gains of land and resource privatization. This is the standard blueprint for developing economies (cheap exports, in particular), taking advantage of low wages to piggyback off growth in wealthier countries by both undercutting their industries and making a pretty penny on their voracious appetites for consumption. There are two overriding problems with a dependence on cheap exports. First, China’s ability to sustain its economy hinged too much on economic conditions outside the country. China has been overly beholden to its customers, most of them located in distant markets, none of them immune to their own periodic downturns in consumption or protectionist social pressures. If the U.S. or European economies crashed, so too would China’s. Following the crash of the U.S. economy in 2008, for example, Chinese exports fell off a cliff – including by a record 26 percent year-over-year in February 2009. That January, the Chinese government estimated that 20 million migrant workers had lost their jobs in 2008 because of the global economic slowdown. Second, the wealthier China becomes, the more difficult it becomes to sustain this export-heavy model. Rising standards of living push wages up, making Chinese exports less competitive and giving foreign firms in the country cause to look to lower-cost alternatives. China wants to accommodate this shift by moving into high-tech, higher-value exports, but here it is facing stiff competition from countries that climbed the value ladder decades ago. 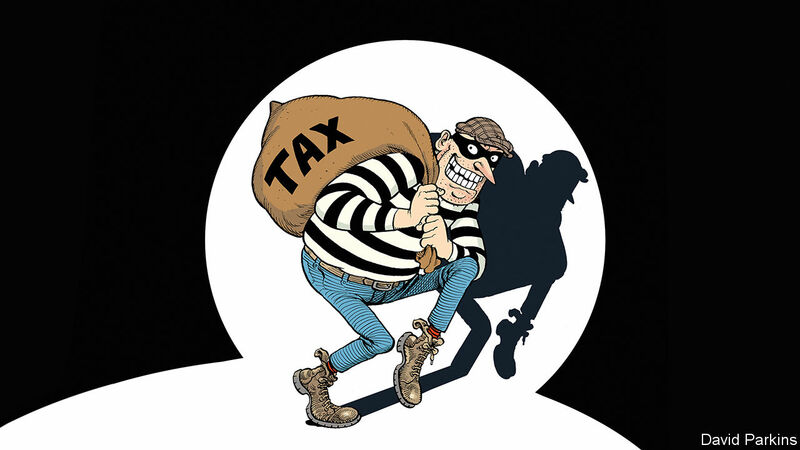 This is known as the middle-income trap – something China is desperate to avoid. The challenge for China has only been intensifying as its neighbors in South and Southeast Asia, in particular, began investing heavily in manufacturing and export infrastructure since putting the regionwide chaos wrought by the Cold War largely behind them. Reliance on investment, the bulk of it government-driven, has enabled Beijing to keep the economy humming somewhat amid global downturns in consumption and (most important, considering China’s outsize socio-economic risks) keep employment generally steady. The 4 trillion yuan ($586 billion) firehose of stimulus Beijing opened up in late 2009 enabled China to bounce back from the crisis much quicker than most of the West. But this created its own problems. In China, among other unintended consequences, it has resulted in a system that’s awash in cheap credit and not enough productive places to put it. This can lead to industrial inefficiency and unprofitability; wildly inflated real estate and land bubbles; and firms, banks and local governments saddled with unsustainable debt loads, among other side effects. The Chinese economy is littered with ticking time bombs. Thus, China is in a race against the clock – before Western economies crash again, before its internal debt loads and asset bubbles start a crisis at home – to rebalance the economy away from low-cost exports and investment and toward domestic consumption, high-value manufacturing and services. China’s aging, shrinking workforce will only make this endeavor more difficult. And now, China has yet another pressing reason to rebalance: the growth of protectionist political forces in Western economies. China’s progress will affect its ability to ride out a trade war with the U.S. In theory, at least, the calculus is fairly straightforward: The less the Chinese economy relies on exports to the U.S., the less measures by the U.S. to limit China’s access to the world’s largest consumer market will sting. And the more U.S. businesses rely on China’s own growing consumer base, the harder China can punch back. On the whole, China’s rebalancing process has proceeded in fits and starts. This is, in part, because different measures can work against each other. For example, reforms to rein in excessive lending to oversized exporting sectors can hurt domestic consumption by, say, lowering employment. More so, it reflects the reality that the Communist Party of China’s paralyzing fear of social unrest and power struggle has compelled Beijing to continually try to thread the needle between structural reforms and the status quo. On external rebalancing, at least, China has indeed been gradually easing its dependence on exports for quite some time. It’s true that China’s slowdown wasn’t nearly as steep as in Western countries. But for about a decade, this, like its “success” on the external balancing front, came primarily from investment – not, as Beijing would hope, from its burgeoning consumer class. From the early 2000s until around 2011, investment as a share of GDP jumped from roughly 37 percent to 47 percent. By comparison, in developed countries, investment generally accounts for around 20 percent of GDP. Meanwhile, the contribution of Chinese consumption to GDP declined from around 63 percent in 2000 to just 48 percent a decade later, before beginning to tick back upward, according to the World Bank and Organization for Economic Cooperation and Development. Initially, the outsize role of investment wasn’t necessarily a problem. China’s entry into the World Trade Organization in 2001 had accelerated an investment boom that, for about a decade, effectively commiserated with a boom in exports. The growth in dependence on exports may have made Beijing uneasy in the big picture, but at least the investment was generally being put to productive and profitable uses. This began to change once demand for exports crashed in 2008, forcing Beijing to start shoveling stimulus money into whatever domestic projects would keep its people and businesses busy. According to International Monetary Fund figures, credit intensity in China – the ratio of credit needed to generate 1 trillion yuan of nominal GDP – soared from around 1.3-to-1 to around 4.8-to-1 in a year after the crisis hit. In other words, investment in China stopped getting the same bang for the buck. Exports rebounded sharply beginning in 2010, and investment as a share of GDP leveled off in 2012. But China’s addiction to credit hadn’t really receded, and the amount of liquidity sloshing around in the system began dragging down efficiency. In 2016, in fact, credit intensity reached 5.3-to-1, surpassing even the stimulus-soaked levels reached in 2009. The reality is that breakneck growth in China was always going to be difficult to perpetuate; as economies grow larger, high growth rates naturally get harder to sustain. The problem in China has been that the government, until recently at least, feared that any major slowdown would lead to social unrest, so it kept its foot on the gas. 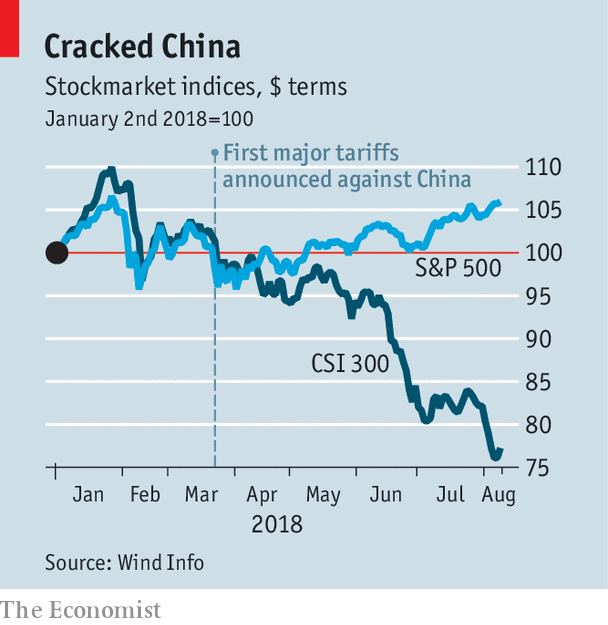 Though relying less on exports and more on investment would theoretically help blunt the direct effects of the trade war in the short term, if it doesn’t make China’s economy more resilient as a whole – or if it actively raises the risk of a financial crisis – it magnifies the risks that any hit to exports from the trade war would destabilize the economy. Investment, in other words, transformed quickly from a palliative to an anabolic steroid, intensifying all sorts of other problems, from unprofitability to credit and land bubbles to local government debt loads to pollution. According to the Institute of International Finance, for example, gross debt rose from 170 percent of GDP to nearly 300 percent between 2008 and 2017. The systemic risks these pose to China is a core reason China has re-embraced the rise of a dictator in the form of President Xi Jinping. Still, since the beginning of this decade, China has found some reason to be optimistic – in particular, the greater role domestic consumption has played as a growth driver. Gross consumption (combined public and private) as a share of GDP growth has gradually ticked upward, from less than 50 percent in 2010 to nearly 65 percent in 2016, according to official figures. As a result, over this same period, investment as a share of GDP growth fell by around 3 percent without dealing a major blow to the economy. Meanwhile, China’s current account surplus has declined from its peak of about 10 percent of GDP in 2007 to 1.3 percent in 2017. Notably, the current account actually registered a rare deficit in the first quarter of this year. Meanwhile, services’ share of GDP is approaching 50 percent – which is important because the sector is less capital-intensive than the industrial sector, less tied to exports and often reflects growing consumer spending. China took a modest step back last year by some metrics, with exports taking a slightly larger share and consumption declining to 59 percent – its first drop in five years. The increased share held by exports can be credited in part to strong global demand, so the increase wasn’t necessarily bad news. Importantly, moreover, investment growth remained in check at 44 percent of GDP growth, roughly in line with recent years. According to the IMF, the credit intensity ratio improved to 3.9-to-1, suggesting credit is being put to better use in at least some sectors as Beijing’s ambitious structural reform agenda has kicked in. On the flip side, return on assets held by China’s 150,000 state-owned enterprises has bottomed out over the past two years to just above 2 percent, a level not hit since the 2000s. Private firms are faring better than SOEs, though even their returns have nonetheless been dropping steadily, from more than 14 percent in 2011 to around 10 percent last year. Notably, SOEs are also playing a more dominant role in the economy, their share of assets growing steadily over the past decade to more than 200 percent of GDP in 2016 and their share of investment nearing a post-2008 high of 150 percent. This matters to the rebalancing effort because SOEs account for around 20 percent of employment and play an outsize role in metabolizing state-directed investment. Considering just how much bloated SOEs are used by Beijing to absorb excess labor, nonperforming loans and toxic assets, their weakness can be viewed as a reflection of the underlying fault lines waiting to rock the economy as a whole. This relates to another reality complicating China’s rebalancing picture: The growth in consumption has relied heavily on public spending. Since the turn of the century, the composition of China’s consumption picture has remained strikingly consistent, with government expenditures accounting for between 25 and 27 percent of total consumption and household spending making up the rest. As a share of GDP, however, private consumption steadily dropped for the first few decades of China’s reform period, from upward of 50 percent in the 1980s to just 35 percent in 2010. If China were truly rebalancing, we’d expect to see Chinese consumers pick up even more of the slack. There are some signs of optimism here, but also ample reason for concern. Since 2010, private consumption as a share of GDP has grown from around 35 percent to just more than 39 percent the past two years. Still, by comparison, private consumption in the U.S. has accounted for upward of 65 percent of GDP since 2000. In Japan, this figure has remained in the mid-50s. The relatively low share of private consumption also stems from core aspects of the economic model that fueled China’s rise. A weak currency, measures that have suppressed wages and deposit rates capped below inflation may all be good for keeping exports competitive, sustaining heavily indebted SOEs and fueling investment, but they also encourage savings at the expense of consumption. (Or, worse, they encourage risky investments in high-yield wealth management products.) The lack of social safety nets has had a similar effect. Of course, this model is what Beijing is now trying to change. Thus, to gauge whether Chinese consumers are both earning and spending more, the indicators to watch going forward will be metrics like household disposable income, retail sales and so forth, as well as household savings and debt. Household disposable income has been rising by around 9 percent per year, ticking slowly upward as a share of GDP, from 59.8 percent in 2013 to 60.6 percent last year. Considering how much GDP has grown, this means that aggregate incomes have surpassed $5 trillion a year. Recent studies by Credit Suisse and McKinsey show that discretionary spending on things like travel and recreation has been surging. Overseas travel, in fact, may be the single biggest contributor to China’s shrinking current account surplus. Meanwhile, household savings as a share of disposable incomes have started to come down, from 38.5 percent in 2013 to 35.5 percent last year. With respect to the trade war, this matters because as Chinese consumer power has grown, so too have U.S. exports to the Middle Kingdom – some 115 percent over the past decade to nearly $120 billion today. General Motors sold nearly a million more cars in China last year than in the United States. Beijing can’t match U.S. tariffs dollar for dollar, because it doesn’t buy enough goods from the U.S. to do so. But it can at least try to make it politically unpalatable for the U.S. to continue the trade war by targeting sectors that look at China’s burgeoning consumer market with yuan signs in their eyes. There are, of course, trade-offs to this shift. For one, household debt in China is surging, from 33 percent of GDP in 2013 to 49.2 percent last year, according to the IMF, putting the debt-to-income ratio in China at 120 percent and growing. This is manageable but rising beyond levels considered safe. Chinese credit card debt has expanded at three times the rate of balances in the U.S., while bank lending to households has surged an estimated 73 percent over the past three years, according to the central bank, most of it going to real estate. Moreover, a vast amount of this debt is held outside the formal banking system. Lending from small online peer-to-peer lenders tripled in volume to 2.3 trillion yuan from 2015 to 2017. Last month, dozens of such lenders went belly up, leading to small-scale protests in Beijing. Moreover, while average household incomes have been rising (by 9.1 percent through the first three quarters of 2017), the median income hasn’t kept pace (up 7.4 percent over the same period). This indicates that income growth has been largely concentrated among high earners. This reflects a dominant underlying reality both driving and constraining the rebalancing effort. In effect, there are two Chinas. One, coastal China, already has an advanced economy climbing the value chain – one that looks quite a bit like its competitors in Japan, South Korea and Taiwan. The other, interior China, hasn’t yet reaped the fruits of the country’s reform and opening period to nearly the same degree; its economy looks quite a bit like a house of cards. Of course, the two Chinas are tied at the hip. Beijing is trying to find a way to make the success of either dependent on the other, to have coastal capital and technology modernize the interior, and to have the interior’s mass reduce the coast’s dependency on foreign buyers and keep the Chinese labor pool competitive. China isn’t all that unique in this regard; the economies of the American West Coast, Texas and the Northeast have long both sustained and benefited from a similar relationship with less prosperous U.S. states. What’s different in China is the whirlwind time frame in which Beijing is trying to complete this process – and the stakes if it fails. Reconciling the gaps between the coasts and the interior is an age-old challenge in China, after all, and one where failure has sunk many a dynasty. Lucrative trades were upended by the second-quarter rise in the dollar. Getting the greenback’s path right matters. Much of the disruption to global financial markets this year has come from a source close to home: the U.S. dollar. Investors obsess over stock indexes and bond yields but the most important number in financial markets may be the dollar’s exchange rate. That was clear when the dollar’s sudden rise in the second quarter derailed many moneymaking trades and changed the path of economies and industries. In some places, the pain is extending: The Turkish lira went into meltdown this week, sending ripples through global markets. Friday, the ICE dollar index hit a fresh one-year high. The dollar’s rebound came after a broad decline in 2017, as growth outside the U.S. picked up. 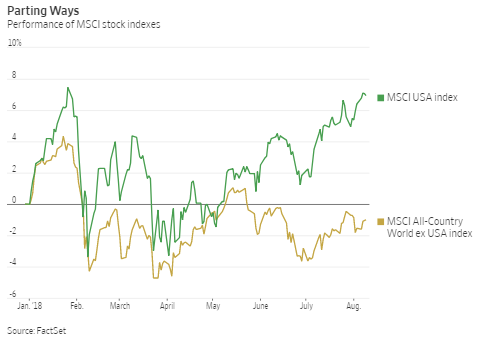 That lured investors into riskier bets: the MSCI Emerging Markets stock index gained over 30%. This year kicked off in similar style. But then U.S. growth vaulted higher and momentum stalled elsewhere, sending the dollar on an unexpected upturn. It gained 5.5% against the euro and 4.2% against the yen in the second quarter; moves in emerging markets were even bigger, with the greenback up 17% against the Brazilian real and 16% against the South African rand. Nearly everything that surged in 2017 has wilted in 2018. 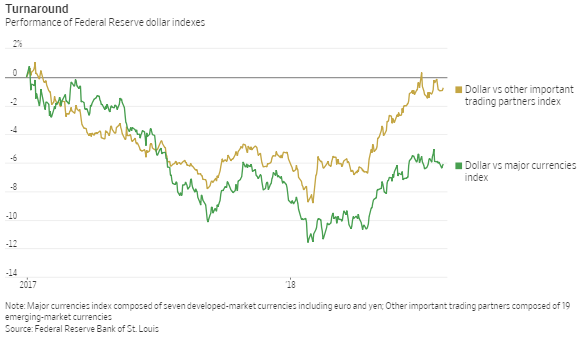 After months of tumult, there is reason to believe the rest of the year will be calmer for the dollar, meaning less risky for emerging markets and other volatile assets. The oddity is that much of the uncertainty about global growth has been generated by unorthodox U.S. policy, whether on tax, trade, or political alliances such as NATO. But even as the U.S. becomes the global disrupter, its assets have proved more alluring for investors. The dollar has kept its role as a magnet in times of doubt. That is in part because the dollar remains so dominant. In the $5.1-trillion-a-day foreign-exchange market, the U.S. currency is on one side of 88% of all trades, according to the Bank for International Settlements’ 2016 survey. 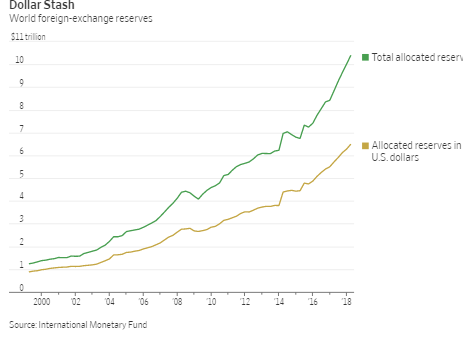 While its weight in foreign-exchange reserves has declined a little, it still accounts for 62.5% of the $10.4 trillion in allocated reserves identified by the International Monetary Fund. The euro, meanwhile, accounts for 20.4%. U.S. capital markets are the biggest and most liquid in the world, making the dollar attractive both to companies looking to raise finance and investors with cash to put to work. The dollar’s path not only reflects changes in global growth, but can also steer them. Most notably, a rising dollar tightens financial conditions in emerging markets: It may lead central banks to raise rates to shore up their currencies, for example, or dampen the appetite of commercial banks to lend in dollars since their chances of getting paid back declines as the local currency falls. While floating exchange rates in emerging markets have reduced the risk of sudden explosive crises, they come at this cost. The dollar’s performance in the second half could be less disruptive. Against major currencies like the euro, the greenback has stopped climbing. A good deal of divergence between growth and monetary policy in Europe and the U.S. already looks priced in. Where the dollar’s strength has exposed weak links in emerging markets, it may continue to cause problems. For countries like Turkey, where the lira is down 36% this year, the problem now is homegrown, not external: There is a serious loss of investor confidence that wouldn’t be solved by a broad-based weakening in the dollar. The bigger picture will be influenced a good deal by the trade dispute between the U.S. and China and whether the Chinese yuan continues to fall, raising depreciation pressures on other currencies. For all that the dollar’s rise has accompanied stronger growth in the U.S.—with second-quarter gross domestic product expanding at a 4.1% annualized clip—there is a domestic downside. Over time, a stronger dollar can hurt U.S. corporate profits as exports become less competitive and foreign earnings are worth less translated back into dollars. While tax cuts have boosted economic growth, they have also raised the budget deficit, which may lead investors to start thinking about the scale of U.S. borrowing. The flip side could be a debate about whether assets denominated in other currencies are cheap enough to be attractive. Growth outside the U.S. has shown signs of stabilizing, and overseas stocks have started to rebound. 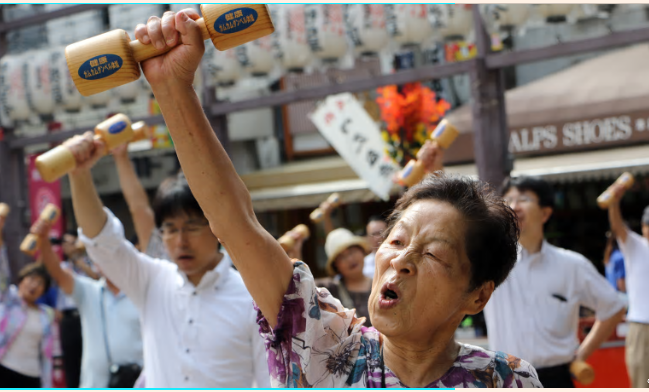 A less disruptive dollar could, given time, add to the momentum beyond American shores.